If you missed the news, the AHL is moving 5 teams to the west coast for the 2015-16 season. One of these will be the Edmonton Oilers' farm team, currently playing in Oklahoma City. 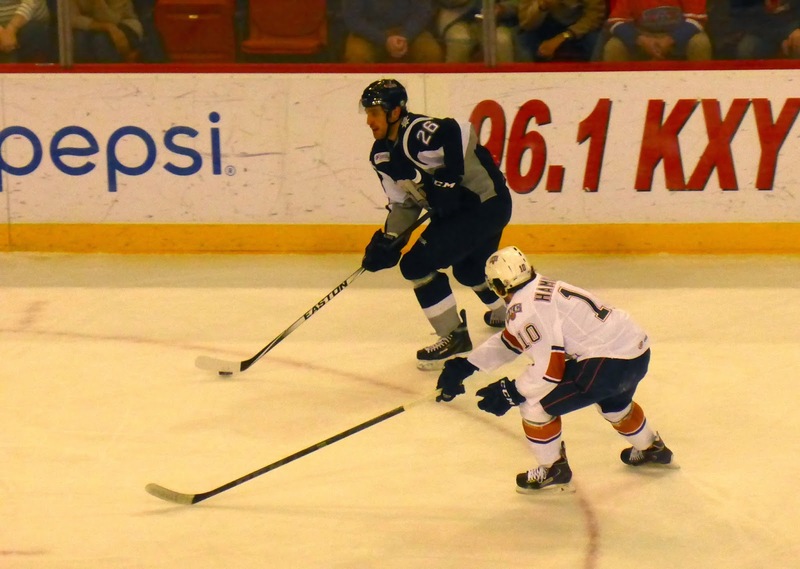 They are on their way to Bakersfield, where the ECHL's Condors are currently competing. When I first heard that the Barons would be moving, I decided to pay a visit as it would be nice to get out of the New York winter. Well, Mother Nature had other ideas. I had a nice road trip planned to Dallas and OKC, but a small winter storm hit the area on Friday, causing me some minor difficulties, including having the Oklahoma Sooner baseball game I planned to attend moved to Las Vegas. I spent Thursday night near DFW airport and awoke to a dusting of snow (a couple of inches of snow with temps around 20F), but the radio referred to it as a major winter blast. If only they knew what a winter blast really is. Driving from DFW to OKC took just over 5 hours (a 200-mile trek) because Texans don't know how to drive in this sort of weather (i.e. slow down, don't brake when you hit some ice, minimize lane changes). There were dozens of accidents reported on the radio and I passed at least ten spinouts along the way. Word of advice: if you've never driven in snow and don't have snow tires, don't risk it. Also, don't drive 20 MPH on an interstate without your lights on and blowing snow. You are a danger to yourself and everyone else. Stay home and be safe. This advice should have been heeded by about half the drivers in the DFW Metroplex today. Anyway, I finally made it to Oklahoma City, where the snow was just flurries and traffic was moving OK. 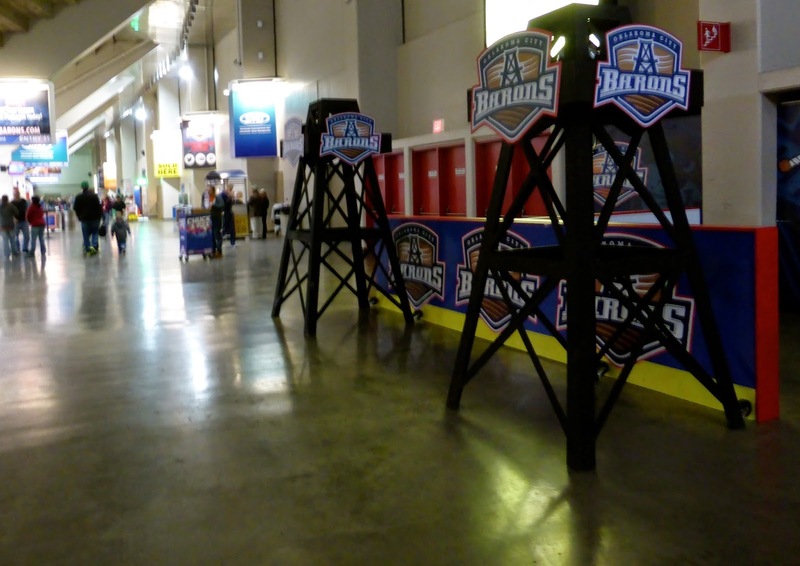 The chill certainly fits hockey well and the Barons were not cancelling their two-game weekend set, so I bundled up and headed over to Cox Convention Center to see them host the San Antonio Rampage. 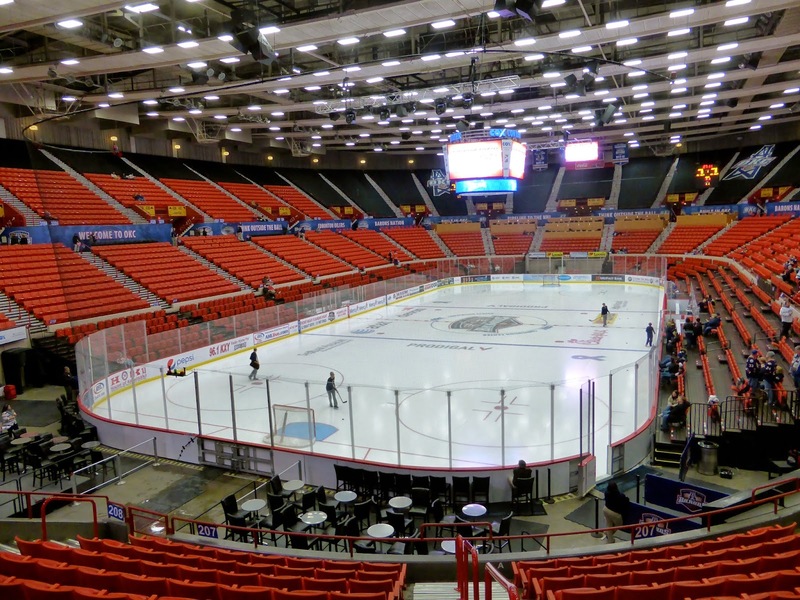 Located across the street from the Chesapeake Energy Arena, the Cox Convention Center is a nondescript building that houses what is actually a pretty good minor hockey rink. Too bad it is about to go into mothballs, at least in this capacity. The team has really adopted the Oilers as their parent club, with their logo (above), oil derricks around the concourse (below), a mascot named Derrick, and uniforms that match. 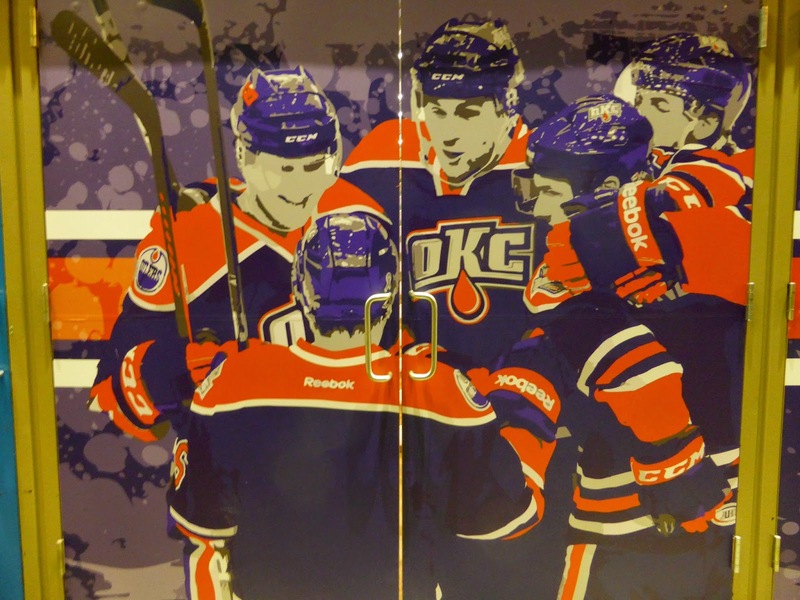 There's art on the doors to the seating bowl which adds a lot to an otherwise dreary concourse. Whoever is running this club really put a lot of thought into making the arena more than just another stop on the minor-league circuit. Inside the seating bowl, the concourse has more signage that is worth a second look. 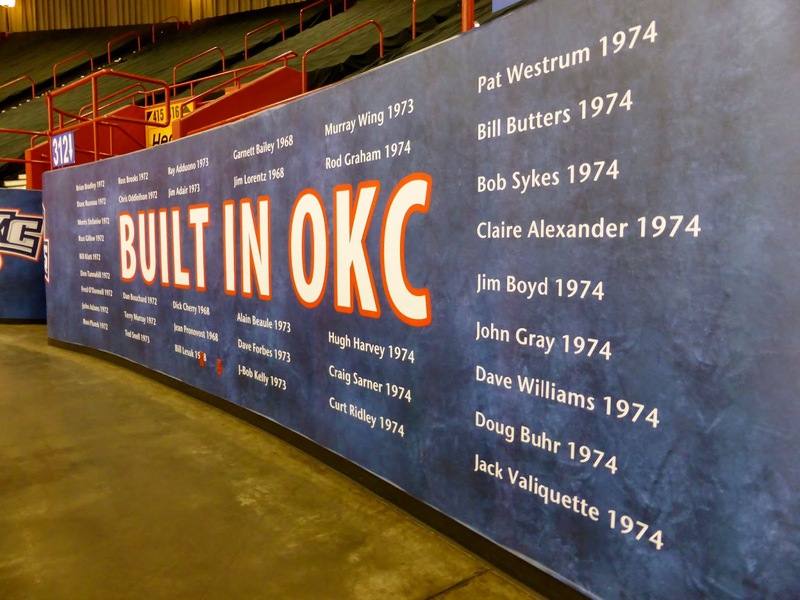 There are several "Built in OKC panels" that list players that played here, including with the old Blazers of the CHL, who were Toronto's farm team for a few seasons in the mid-1970s. Tiger Williams played 39 games (and earned 202 penalty minutes) here before being called up to the Maple Leafs in 1974. 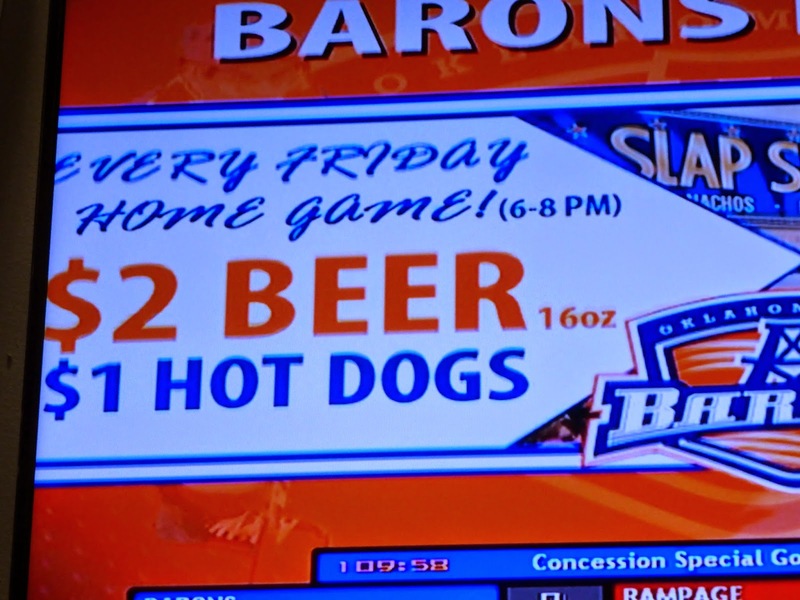 The only other thing worth noting is that the Barons have a nice special on Fridays, with $2 Buds and $1 hot dogs. Even then, only 2,560 fans showed up. As the CCCA won't be used a pro rink next season, there is not much point in describing it any further. I expect that an ECHL team will eventually move here as there seems to be a good fan base and a rink that will be ready to use. 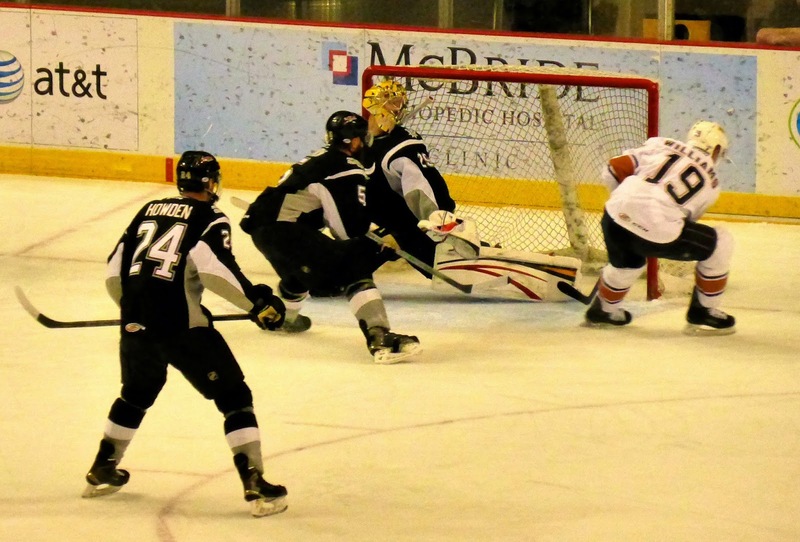 The Barons led the Western Division with 72 points, while the visiting San Antonio Rampage (Florida's affiliate) were 2nd, seven points back. It didn't take long for San Antonio to get on the board as Mark Mancari (#26 above, played junior in Ottawa) ripped a shot that beat Baron keeper Laurent Broissoit up high just 89 seconds in. OKC tied it at 4:44 when Brad Hunt (who enjoyed 11 games with Edmonton this season) joined the rush, took the puck after crossing the blue line, faked a slap shot, moved to his left and slid a perfect shot along the ice to surprise Michael Houser (stretching out below). The Rampage scored the only goal of the second when a loose puck bounced to NHL veteran John McFarland (who had a brief spell with the Ottawa 67s) alone in front of a helpless Broissoit. A minute into the third, another lucky bounce saw the puck land on the stick of NHL veteran Shane O'Brien, who snapped one home. 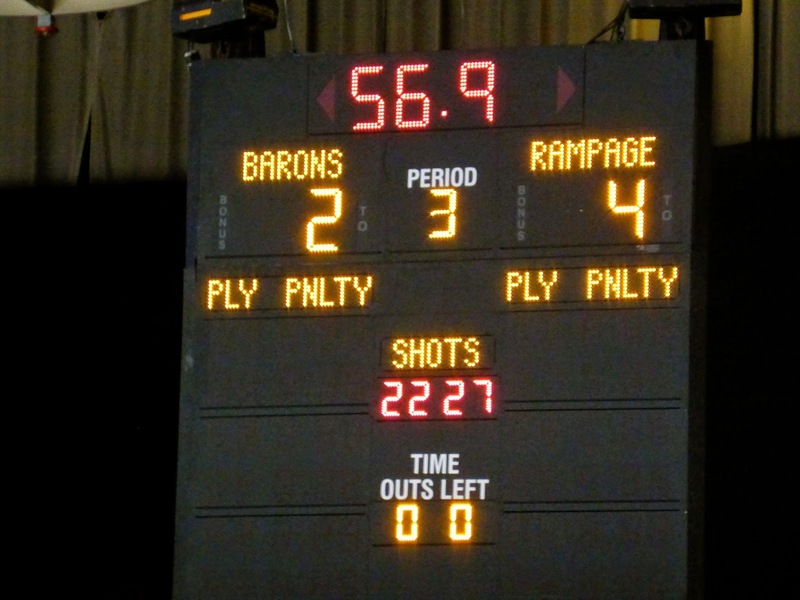 The Barons got that one back on a power play marker from Bogdan Yakimov but they could not get any closer, giving up an empty netter in the last minute to lose 4-2. This was a pretty entertaining matchup, with a lot of back and forth play. Compared to some of the snoozers I've seen in the NHL this year, this might have been the best value for the money, with tickets just $10 and the aforementioned special limiting my food budget to $6. 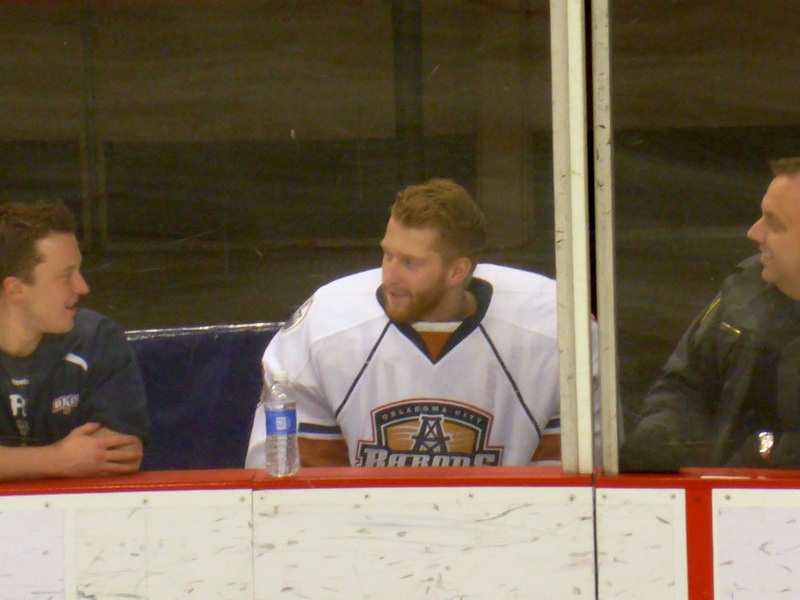 The bench is too small to allow the backup goalie (Tyler Bunz in this case) to sit there, so he has to sit behind the glass and chat with the staff. Not a bad gig. I have plans to visit Manchester, Worcester, and Glens Falls in March. All three will be losing their team to the west coast. Norfolk is also heading to California, but I don't know if I'll be able to squeeze a visit there before the end of the season, but I'll try. I have a college basketball doubleheader today (Oklahoma at 1, UT-Arlington at 7:15), but with a 3 hour drive between them and the weather still a bit wonky, I don't think I will make the second game. Check back Sunday to see if I did.